Apply Uber promo code Malaysia below to get discounted rides in Malaysia where Uber X e-hailing service is available. Congrats! 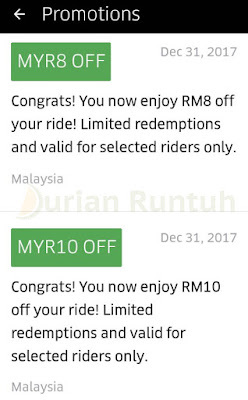 You now enjoy RM10 off your ride! Limited redemptions and valid for selected riders only. Valid in Malaysia until 31 December 2017. Congrats! You now enjoy RM8 off your ride! Limited redemptions and valid for selected riders only. Valid in Malaysia until 31 December 2017.